Once you have your billing system setup, please email billingactivation@teamunify.com to begin producing monthly invoices. Now that your Chart of Accounts are in place, it’s time to enter the basics of your billing setup. In the side menu click Billing Admin > Billing Setup to get started (or click the General Setup tab if you just finished the CoA Setup). 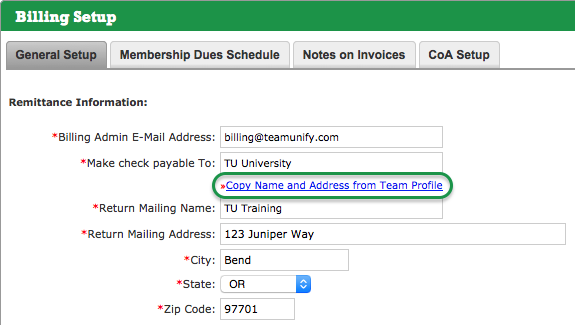 Billing Admin E-Mail Address — TeamUnify sends this address an automated billing reminder on the 21st of each month. If your team accepts credit cards, we also email this address on the 15th a list of CCs about to expire so you can have families update their CC prior to the 1st. See our Knowledge base article, credit card expiration failure and report, for more info. Note: This address is not used when emailing a Billing Summary or Invoice. When someone replies to either of those, the reply-to address will actually be the address of the admin who sent the email. Make check payable To — Fill in your team name here, although the data in this field isn’t currently used. Click Copy Name and Address from Team Profile to save time filling out the next five fields, then change anything if needed. Return Mailing Name and address fields — These appear on the invoices generated by the system. The name should be the one to whom parents make out checks and the address to where they mail them. Even if your team does not accept checks, it should be the address to where they mail billing correspondence. These settings determine what account holders can and cannot do with their payment methods on file. 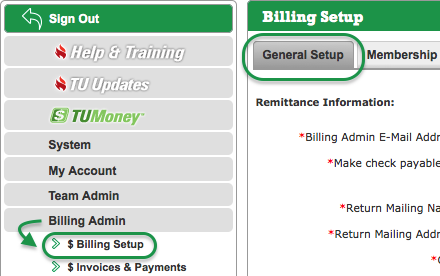 See our Payment Option Settings article for more info. Remove Option to Pay Manually — When checked, an Account will not have the Mail Payments area as an option. The exception is those who have not yet set up an electronic payment method. Checking this is a best practice for teams with electronic processing to improve cash flow and remove the hassle from handling checks. Require CC on file for OnDemand Charge — When not checked, they will have a “Do not allow CC On Demand Payments” option in the Mail Payments area, in addition to “Use for On Demand Payments” for each CC. When checked, only the latter for each CC will show. Disable the Remove Card functionality — When checked, an Account will not have a Remove link by each CC. They will need to have a Super User remove CCs for them. Disable the Remove ACH functionality — When checked, an Account will not have a Remove link by their ACH account. They will need to have a Super User remove the ACH for them. You already did this. But if you need more information see Billing Group Setup. You will usually leave this blank because Sub Billing Groups determine when to not bill people. The time to use it would for something like a month-long pool closure where no one can swim. If it's closed in May and June, for example, put 5,6 in the field with no space after the comma. This will result in no recurring fees being generated on the 1st of May and June as described below the field. However, note that invoices will still be generated for any non-recurring fees in accounts such as meet fees. Just make sure to come back and delete those after the time has ended or else no one will get charged next May and June. Invoice amounts are due in the same month the invoice is created; it is not possible to extend the due date or late fee date beyond the same month. Non-recurring fees you generate this month will not be due until invoiced the following month. Important: Invoices are always generated on the 1st and credit cards/ACH accounts are always charged on the 1st or 2nd regardless of the Due Date set. Due Date — This appears on invoices and is the date by which you want people to pay, but there is no penalty if they don’t. They actually have up to the day before the Late Fee date; similar to the landlord saying rent is due on the 1st but not charging a late fee until the 5th. If you have electronic payment processing active, set this date to the 1st since that’s when everyone’s credit card account will get charged. Chart of Account for Late Fee — Even if you don’t charge a late fee, you still need to select a CoA. Late Fee — TeamUnify recommends setting the late fee date to the 15th or later; this allows plenty of time for ACH payments to go through. Once midnight of this date arrives, the system will add a late fee invoice (if set to non-zero) to any account with a balance, even non-active accounts. This does not include any non-recurring fees created after the invoice is generated on the 1st. 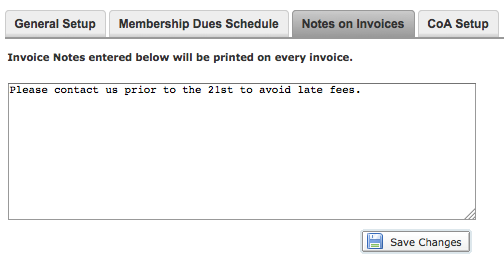 Setting a late fee is a good incentive to encourage payment on time. Even if you only accept credit cards, it helps deter parents from not updating their credit card info if their payment fails. Set Automatically email the account if charging their Credit Card fails to Yes and it will do just that. Setup Account Processing Fees For OnDemand Electronic Payment – Ignore this if you do not have credit card processing enabled on your site. Set “Enable Individual Account Payment” to Yes to enable parents to log in at any time and make an immediate payment with the credit card (CC) they have on file. This is a great option if you want them to pay for meet fees this month prior to them being invoiced next month. They can also use it to pay for part or all of their current account balance. Minimum Payment Amount — Parents will not be able to make an on-demand payment for an amount less than this. Transaction Fees — Here you can pass along the CC processing fees to the parents that you are charged. This is known as surcharging. This only applies to on-demand payments and not monthly auto payments. Please note that surcharging is illegal in certain states (CA, CO, CT, FL, KS, ME, MA, NY, OK, and TX as of Oct 2016). Visa and Mastercard also prohibit this outside of the USA except where required by law. They also prohibit surcharging more than the CC fees charged to your team. Please check your state laws or contact your Customer Success Coach for more info. Charge Per Transaction Fee if Payment Fails — If a CC payment fails, your team is only charged the flat fee and not a percentage. This allows you to pass along that fee as well. Hour Delay Between Failed Payments — Only whole numbers are allowed here. Adding a delay after a payment fails prevents rapid payment resubmissions after a failed payment so that hopefully a parent will carefully check their CC data and contact you if needed to help resolve payment problems. Click Save Changes after entering all your data. After you have saved your changes, now click the Notes on Invoices tab and enter any message you’d like printed at the bottom of all invoices, such as late fee information. Click Save Changes when finished. Now that your Billing General Setup is complete it’s time to enter your recurring fees.